Basically, the news is that some leading solar hardware manufacturers are now seeing a big stock surge. The idea presumably being: if a leading solar installer is promising a bright future, the same should be true for some leading hardware companies. Oh yeah, plus, JA Solar’s revenue for the quarter was $270 million rather than the projected $226, which apparently helps its stock out quite a bit, as well as similar companies yet to announce their quarterly figures. The company also shored up its finances by paying off $119 million in convertible notes this month, inspiring at least one worrywart on Wall Street to change its tune. 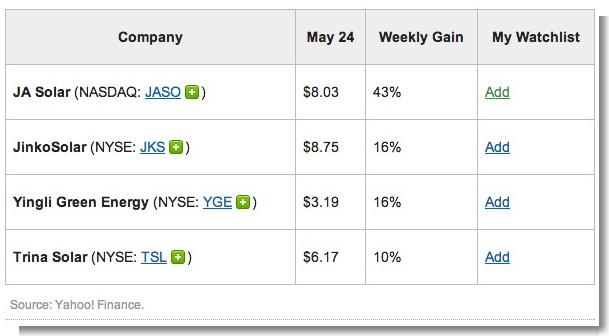 RBC Capital is boosting its price target on JA Solar from $1 to $8. When a solar-energy company posts a positive surprise, it benefits peers that will be reporting later, and that helps explain the double-digit percentage gains at the three other winners that will stepping up with fresh financials in the coming days. Trina and Yingli will report quarterly results on Wednesday and Thursday, respectively. The market isn’t holding out for great performances here. Trina and Yingli are expected to post widening quarterly deficits with double-digit percentage declines in revenue. However, JA Solar’s robust report suggests that there may be some upside surprises in those dreary outlooks. Only One Master Of Business Administration Program With Focus On Renewable Energy?